The use of resin composites and adhesives in dental restorations is ubiquitous. However, the longevity of resin composites is less than that of comparable restorative materials, mainly because of higher fracture rates and greater prevalence of secondary caries. Dental resin composites and adhesives contain ester links, which are vulnerable to biochemical hydrolysis by esterase activity from human saliva and bacteria. In this article, we review biodegradation processes that occur in the oral cavity and their contribution to the premature failure of resin composites. Biodegradation causes deterioration of resin composite bulk and the composite–tooth interface and releases by-products, such as methacrylic acid, triethylene glycol and bishydroxy-propoxy-phenyl-propane. These by-products have been shown to affect cariogenic bacterial growth and virulence. A compromised restoration–tooth interface allows saliva and oral bacteria to infiltrate the spaces between the tooth and the composite, exacerbating the effects of biodegradation, undermining the restoration and leading to recurrent caries, hypersensitivity and pulpal inflammation. 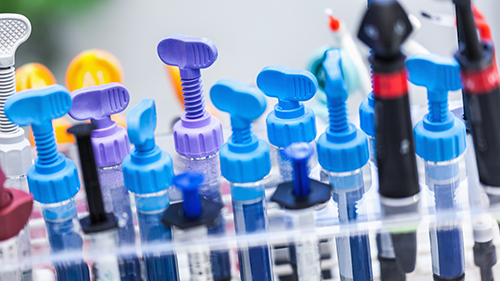 It is important to consider the biochemical stability of these materials to advance their chemistry beyond the current formulations and conceive more biochemically stable and better-performing dental resin composites and adhesives. This review begins with an introduction to resin composites and adhesives, followed by an analysis of the biochemical stability of these materials when challenged with human salivary esterases. The effects of bacteria on the biochemical stability of resin composite restorations and the reciprocal effects of degradation by-products on the bacteria are then discussed. 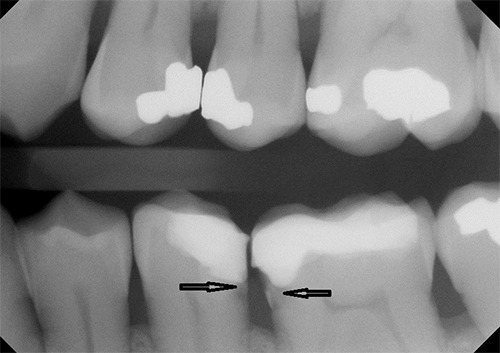 Figure 1: Radiographic image of secondary caries at the resin composite–tooth interface (arrows). Figure 2: Structure and hydrolysis of the common dimethacrylate monomers, bisphenol-glycidyl-dimethacrylate (BisGMA) (a) and triethylene glycol dimethacrylate (TEGDMA) (b), by salivary and bacterial esterases, resulting in the production of the by-products, bishydroxy-propoxy-phenyl-propane (BisHPPP), triethylene glycol methacrylate (TEGMA), triethylene glycol (TEG) and methacrylic acid (MA). Figure 3: Structural formula of γ-methacryloxypropyltrimethoxy silane. The degradation of dental resin composites and adhesives in the oral cavity is a result of many complex interactions, physical and biochemical. Most research has focused on the physical processes (food, chewing, etc.) that lead to degradation. These are classified as either material loss and uptake (sorption, extraction, dissolution and mineralization) or physical changes (softening, stress cracking, fatigue fracture, etc. ).9 In contrast, biochemical processes have seldom been discussed until recently. Surface morphology of the cured composite was also found to contribute to the observed differences, as some configurations offer easier access to human salivary esterases and, therefore, more binding sites.11,12,40 Another factor may be the fact that urethane-modified BisGMA resin associated with TPH is more stable and resistant to hydrolysis and, thus, results in less release of degradation products.12 Furthermore, dental resin composites with higher silanated filler content have been shown to be less susceptible to the effects of degradation,11 unlike non-silanated filler particles, which are more susceptible, because of the lack of chemical bonding between the filler and the matrix.40 Therefore, the degradation product profile varies in terms of identity and amount depending on the composition of the resin composite or adhesive under investigation. In a more recent investigation, Serkies et al.,25 found similar effects on total-etch interfaces; however, self-etch specimens showed no reduction in fracture resistance even after 180-day incubation with simulated salivary esterase activities. The authors concluded that material composition and mode of application could affect the biochemical stability of the resin–dentin interface. In another study, Kermanshahi et al.23 found an increase in the amount of BisHPPP and interfacial cariogenic bacterial microleakage following incubation of resin composite bonded to dentin using a total-etch system after incubation with salivary esterase-like activity for up to 90 days. Using transmission electron microscopy, Jung et al.45 found increased nanoleakage in the resin–dentin interface after storage in an esterase solution compared with a phosphate buffer solution after 4 weeks. Using collagenase and acetylcholinesterase to simulate oral salivary enzymes, Chiaraputt et al.41 found that the microtensile bond strength of resin composite (Z350, 3M) bonded to human dentin using 4 different total-etch or self-etch adhesives was significantly lower when incubated in enzymes compared with incubation in water or not incubated. They also found that the self-etch adhesives exhibited “water-tree” patterns within the adhesive layer, probably because of the hydrophilicity of the adhesive,25,26 and that the total-etch adhesive exhibited nanoleakage within the hybrid layer and the adhesive, probably because of its incomplete penetration into the demineralized collagen network.25,26 Both phenomena compromised the interface, potentially affecting the restoration’s longevity. Although studies have investigated the impact of oral saliva on dental resin composites and adhesives, few have looked at the effect of bacteria on these substances. Such research has shown bacteria’s ability to penetrate microgaps caused by esterases and form colonies. Kermanshahi et al.23 showed that exposing dentin–composite restorations bonded with total-etch adhesive to salivary esterase-like activity resulted in the formation of micro-gaps that were infiltrated and colonized by biofilms of the cariogenic bacteria Streptococcus mutans. Dental caries are believed to be the result of acid released by bacterial activity that leads to the demineralization of tooth structures. Streptococcus mutans has been found in dental plaque at the margins of composite fillings and is regarded as a major etiological agent responsible for dental caries. Overall, these results point toward the degradative effects of bacteria on dental resin composites and adhesives and highlight the potential for secondary caries and changes in esthetic properties seen clinically with the use of resin materials in dental restorations. More recent studies have demonstrated a broader effect of TEG and BisHPPP on gene expression, as well as associated proteins related to the virulence of the cariogenic bacteria, Streptococcus mutans.19,20 These findings directly link biodegradation to bacterial proliferation in the oral cavity. This implies that resin composites, in their current form, are not only structurally vulnerable, but can also contribute to the progression of oral disease by increasing growth and virulence of the bacteria that grow over them and within the restoration–tooth margins. On the other hand, other studies have found that BisGMA degradation products (BisHPPP and methacrylic acid) slightly inhibit growth of Streptococcus mutans,7,21 suggesting that different degradation products have different effects on oral bacteria and that the effect is strain-dependent. Therefore, to reach a convincing conclusion on the complete effect of degradation products on bacterial activity in the oral cavity, research must be conducted on the effect of cumulative degradation products on bacterial growth and virulence, also in multi-species cultures relevant to dental plaque. Although dental resin composite and adhesive restoration materials have advantages, such as esthetic appeal, and no perceived danger of mercury poisoning, they seem to be at a disadvantage in terms of long-term stability, as they are affected by physical and biochemical challenges. Biochemical interactions may favour the proliferation of cariogenic bacteria and alter their virulence, thus potentially contributing to an increase in secondary caries and resin composite failure. Because the oral cavity is complex and various influences are acting in concurrence, it is evident that more research must be done to better understand the problems surrounding resin composites and adhesives to improve not only their physical properties, but also their biostability and interactions with oral biofilms. Dr. Bourbia completed his MASc and DDS studies at the University of Toronto faculty of dentistry and is currently in private practice, Toronto, Ontario, Canada. Dr. Finer is the George Zarb/Nobel Chair in Prosthodontics at the faculty of dentistry, University of Toronto, and is cross-appointed to the Institute of Biomaterials and Biomedical Engineering, University of Toronto, Toronto, Ontario, Canada. Opdam NJ, Bronkhorst EM, Loomans BA, Huysmans MC. 12-year survival of composite vs. amalgam restorations. J Dent Res. 2010;89(10):1063-7. Opdam NJ, van de Sande FH, Bronkhorst E, Cenci MS, Bottenberg P, Pallesen U, et al. Longevity of posterior composite restorations: a systematic review and meta-analysis. J Dent Res. 2014;93(10):943-9. Soncini JA, Maserejian NN, Trachtenberg F, Tavares M, Hayes C. The longevity of amalgam versus compomer/composite restorations in posterior primary and permanent teeth: findings from the New England Children’s Amalgam Trial. J Am Dent Assoc. 2007;138(6):763-72. Burke FJ, McHugh S, Hall AC, Randall RC, Widstrom E, Forss H. Amalgam and composite use in UK general dental practice in 2001. Br Dent J. 2003;194(11):613-8; discussion 609. Burke FJ, Wilson NH, Cheung SW, Mjör IA. Influence of patient factors on age of restorations at failure and reasons for their placement and replacement. J Dent. 2001;29(5):317-24. Demarco FF, Corrêa MB, Cenci MS, Moraes RR, Opdam NJ. Longevity of posterior composite restorations: not only a matter of materials. Dent Mater. 2012;28(1):87-101. Khalichi P, Cvitkovitch DG, Santerre JP. Effect of composite resin biodegradation products on oral streptococcal growth. Biomaterials. 2004;25(24):5467-72. Santerre JP, Shajii L, Tsang H. Biodegradation of commercial dental composites by cholesterol esterase. J Dent Res. 1999;78(8):1459-68. Santerre JP, Shajii L, Leung BW. Relation of dental composite formulations to their degradation and the release of hydrolyzed polymeric-resin-derived products. Crit Rev Oral Biol Med. 2001;12(2):136-51. Finer Y, Santerre JP. Salivary esterase activity and its association with the biodegradation of dental composites. J Dent Res. 2004;83(1):22-6. Finer Y, Santerre JP. Influence of silanated filler content on the biodegradation of bisGMA/TEGDMA dental composite resins. J Biomed Mater Res A. 2007;81(1):75-84. Finer Y, Santerre JP. The influence of resin chemistry on a dental composite’s biodegradation. J Biomed Mater Res A. 2004;69(2):233-46. Bourbia M, Ma D, Cvitkovitch DG, Santerre JP, Finer Y. Cariogenic bacteria degrade dental resin composites and adhesives. J Dent Res. 2013;92(11):989-94. Cai K, Delaviz Y, Banh M, Guo Y, Santerre JP. Biodegradation of composite resin with ester linkages: identifying human salivary enzyme activity with a potential role in the esterolytic process. Dent Mater. 2014;30(8):848-60. Delaviz Y, Finer Y, Santerre JP. Biodegradation of resin composites and adhesives by oral bacteria and saliva: a rationale for new material designs that consider the clinical environment and treatment challenges. Dent Mater. 2014;30(1):16-32. Lin BA, Jaffer F, Duff MD, Tang YW, Santerre JP. Identifying enzyme activities within human saliva which are relevant to dental resin composite biodegradation. Biomaterials. 2005;26(20):4259-64. Jaffer F, Finer Y, Santerre JP. Interactions between resin monomers and commercial composite resins with human saliva derived esterases. Biomaterials. 2002;23(7):1707-19. Khalichi P, Singh J, Cvitkovitch DG, Santerre JP. The influence of triethylene glycol derived from dental composite resins on the regulation of Streptococcus mutans gene expression. Biomaterials. 2009;30(4):452-9. Sadeghinejad L, Cvitkovitch DG, Siqueira WL, Merritt J, Santerre JP, Finer Y. Mechanistic, genomic and proteomic study on the effects of BisGMA-derived biodegradation product on cariogenic bacteria. Dent Mater. 2017;33(2):175-90. Sadeghinejad L, Cvitkovitch DG, Siqueira WL, Santerre JP, Finer Y. Triethylene glycol up-regulates virulence-associated genes and proteins in Streptococcus mutans. PloS One. 2016;11(11):e0165760. Singh J, Khalichi P, Cvitkovitch DG, Santerre JP. Composite resin degradation products from BisGMA monomer modulate the expression of genes associated with biofilm formation and other virulence factors in Streptococcus mutans. J Biomed Mater Res A. 2009;88(2):551-60. Brännström M. Communication between the oral cavity and the dental pulp associated with restorative treatment. Oper Dent. 1984;9(2):57-68. Kermanshahi S, Santerre JP, Cvitkovitch DG, Finer Y. Biodegradation of resin-dentin interfaces increases bacterial microleakage. J Dent Res. 2010;89(9):996-1001. Murray PE, Windsor LJ, Smyth TW, Hafez AA, Cox CF. Analysis of pulpal reactions to restorative procedures, materials, pulp capping, and future therapies. Crit Rev Oral Biol Med. 2002;13(6):509-20. Serkies KB, Garcha R, Tam LE, De Souza GM, Finer Y. Matrix metalloproteinase inhibitor modulates esterase-catalyzed degradation of resin-dentin interfaces. Dent Mater. 2016;32(12):1513-23. Shokati B, Tam LE, Santerre JP, Finer Y. Effect of salivary esterase on the integrity and fracture toughness of the dentin-resin interface. J Biomed Mater Res B Appl Biomater. 2010;94(1):230-7. Van Meerbeek B, Van Landuyt K, De Munck J, Hashimoto M, Peumans M, Lambrechts P, et al. Technique-sensitivity of contemporary adhesives. Dent Mater J. 2005;24(1):1-13. Ferracane JL. Resin composite — state of the art. Dent Mater. 2011;27(1):29-38. Klapdohr S, Moszner N. New inorganic components for dental filling composites. Monatshefte für Chemie. 2005;136(1):21-45. Obici AC, Sinhoreti MAC, Frollini E, Correr Sobrinho L, Consani S. Degree of conversion of Z250 composite determined by fourier transform infrared spectroscopy: comparison of techniques, storage periods and photo-activation methods. Mater Res. 2004;7(4):605-10. Finer Y, Jaffer F, Santerre JP. Mutual influence of cholesterol esterase and pseudocholinesterase on the biodegradation of dental composites. Biomaterials. 2004;25(10):1787-93. Finer Y, Santerre JP. Biodegradation of a dental composite by esterases: dependence on enzyme concentration and specificity. J Biomater Sci Polym Ed. 2003;14(8):837-49. Hagio M, Kawaguchi M, Motokawa W, Miyazaki K. Degradation of methacrylate monomers in human saliva. Dent Mater J. 2006;25(2):241-6. Hsu WY, Wang VS, Lai CC, Tsai FJ. Simultaneous determination of components released from dental composite resins in human saliva by liquid chromatography/multiple-stage ion trap mass spectrometry. Electrophoresis. 2012;33(4):719-25. Van Landuyt KL, Snauwaert J, De Munck J, Peumans M, Yoshida Y, Poitevin A, et al. Systematic review of the chemical composition of contemporary dental adhesives. Biomaterials. 2007;28(26):3757-85. Osorio E, Toledano M, Yamauti M, Osorio R. Differential nanofiller cluster formations in dental adhesive systems. Microsc Res Tech. 2012;75(6):749-57. Peumans M, Kanumilli P, De Munck J, Van Landuyt K, Lambrechts P, Van Meerbeek B. Clinical effectiveness of contemporary adhesives: a systematic review of current clinical trials. Dent Mater. 2005;21(9):864-81. Moszner N, Salz U, Zimmermann J. Chemical aspects of self-etching enamel-dentin adhesives: a systematic review. Dent Mater. 2005;21(10):895-910. Mirmohammadi H, Kleverlaan CJ, Aboushelib MN, Feilzer AJ. Influence of salivary enzymes and alkaline pH environment on fatigue behavior of resin composites. Am J Dent. 2011;24(1):31-6. Shajii L, Santerre JP. Effect of filler content on the profile of released biodegradation products in micro-filled bis-GMA/TEGDMA dental composite resins. Biomaterials. 1999;20(20):1897-908. Chiaraputt S, Roongrujimek P, Sattabanasuk V, Panich N, Harnirattisai C, Senawongse P. Biodegradation of all-in-one self-etch adhesive systems at the resin-dentin interface. Dent Mater J. 2011;30(6):814-26. Park JG, Ye Q, Topp EM, Spencer P. Enzyme-catalyzed hydrolysis of dentin adhesives containing a new urethane-based trimethacrylate monomer. J Biomed Mater Res B Appl Biomater. 2009;91(2):562-71. Skovron L, Kogeo D, Gordillo LA, Meier MM, Gomes OM, Reis A, et al. Effects of immersion time and frequency of water exchange on durability of etch-and-rinse adhesive. J Biomed Mater Res B Appl Biomater. 2010;95(2):339-46. Zou Y, Jessop JL, Armstrong SR. In vitro enzymatic biodegradation of adhesive resin in the hybrid layer. J Biomed Mater Res A. 2010;94(1):187-92. Jung YJ, Hyun HK, Kim YJ, Jang KT. Effect of collagenase and esterase on resin-dentin interface: a comparative study between a total-etch adhesive and a self-etch adhesive. Am J Dent. 2009;22(5):295-8. Fúcio SB, Carvalho FG, Sobrinho LC, Sinhoreti MA, Puppin-Rontani RM. The influence of 30-day-old Streptococcus mutans biofilm on the surface of esthetic restorative materials — an in vitro study. J Dent. 2008;36(10):833-9. Gregson KS, Shih H, Gregory RL. The impact of three strains of oral bacteria on the surface and mechanical properties of a dental resin material. Clin Oral Investig. 2012;16(4):1095-103. Beyth N, Bahir R, Matalon S, Domb AJ, Weiss EI. Streptococcus mutans biofilm changes surface-topography of resin composites. Dent Mater. 2008;24(6):732-6.